Detectives Eitaro Imanishi (Tetsuro Tamba) and Hiroshi Yoshimura (Kensaku Morita) investigate the murder of retired police officer Miki Kenji (Ken Ogata). Their only clue is that the suspect is named Kameda and he speaks in a northern dialect. Three seemingly unrelated stories weave together to uncover the mystery behind his death. 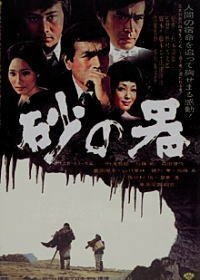 Based on the 1961 novel "Suna no utsuwa" by Seicho Matsumoto.